Ed Knott at work in his Albion office. As the use of technology has grown in rural Nebraska, the work of Applied Connective Technologies has evolved. State-of-the-art technology is now required by a variety of businesses in rural Nebraska, and Ed Knott and his team of technical experts at Applied Connective are providing it. 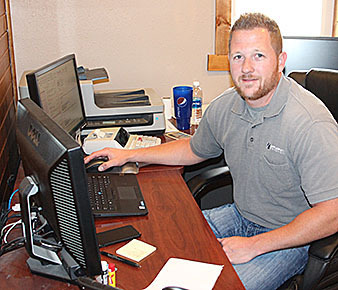 Knott, a native of Taylor, NE, established Applied Connective with Tom Krings in 2004 as a two-person operation offering commercial phone systems and IT services to local businesses. The business started in Cedar Rapids, and soon moved to an office space on Third Street in Albion in 2006. The first additional employee was hired in 2008. Since that time, the company has steadily grown and evolvedinto a full-service technology group with 17 employees and additional offices in Fullerton and Columbus. Due to necessity and demand, Applied Connective has built upon its initial offerings and now provides a wide range of technology solutions, including Internet, managed IT, phone systems, access control, surveillance and professional audio/video. 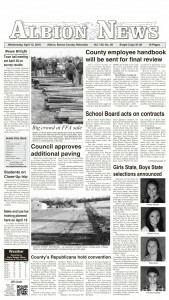 The company will soon have 19 total employees with the addition of two new technicians in late March. Read more in the March 22 Albion News Print and E-editions.